This Universal Waterproof Sports Case is a must-have accessory for your smartphone and/or MP3 player - compatible with iPhones, iPods, Androids and most of today's latest devices. You'll be able to instantly waterproof your device and add an extra line of protection. Use it by the pool, at the beach, in the tub or at anytime you're expecting some weather. You'll enjoy full functionality and maintain the waterproof seal once you insert your device. Engineered clear plastics on the front and back allow you to use the touchscreen function and still allow you to snap some pictures. IPX-7 certified waterproof standard ensures protection against the elements and can withstand submersion in water up to 3.3 feet for 30 seconds. 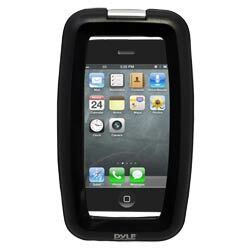 Give your pricey electronics the protection they deserve with the Universal Waterproof Sports Case. Refer to inner dimensions for device compatibility.